A little while back I took a little trip to Mexico, by way of San Diego. As with all of my trips, it became an accidental whirlwind of unintentional comedy and goofy stuff. Here are some of my dispatches from the road, written on the trip. 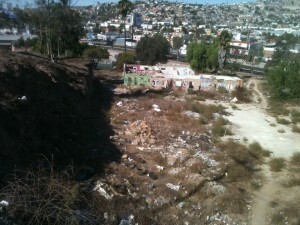 We cross the border and head into Tijuana. 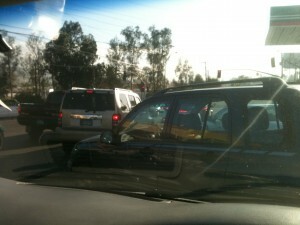 Tijuana traffic doesn’t even all go the same way sometimes. Imagine the bad part of your town, the part you hate to drive through and can’t wait to get out of. That’s Tijuana, except it’s that part over and over again, except with more people and fewer traffic rules. Did I say fewer? Ha-HA! I meant absolutely none. 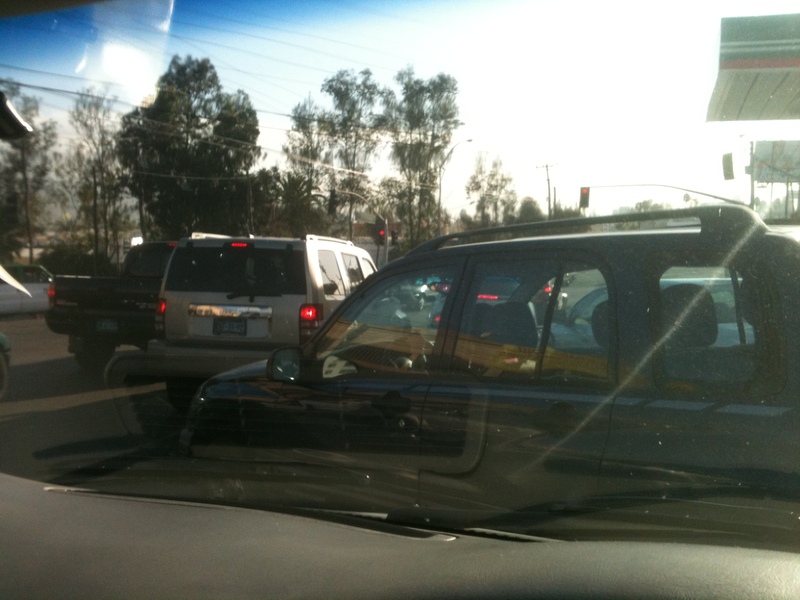 Tijuana traffic is an automotive Black Friday, it’s like everyone at the Super Bowl all leaving at the same time and racing through the parking lot of an outlet mall for the one exit that leads directly to the freeway. It didn’t phase my driver, though. He cut through traffic with reckless abandon, like he was in a movie. The lines on the road aren’t even suggestions to him, at one point swerving over through two lanes to come to a dead stop in a moving lane of traffic to buy breakfast burritos from a road side vendor, selling homemade foods out of a cooler. Tijuana is everything, everywhere, all the time. It’s a crowded, manic border town that never ends, existing while simultaneously moving in every direction at once. It’s maddening and fascinating all at the same time. It reminds me of post-Katrina New Orleans in some ways, in that there’s no order or reason to what happens where. In the part of town where I’m staying, the layout is very odd. There’s a private hospital, with a burned out slum next to it. At the end of the street, there’s a floor tile warehouse store, and then there’s an empty patch of land that’s a good enough size for an office building, or maybe a small park. However, it seems to be in use as a place where people drop their garbage. Next to the private hospital is an open area with a chain link fence, and a wooden door to enter it. I quickly realized the door wasn’t attached to anything, and the fenced-in open area was where someone lived. It’s a different world from what I’m used to, obviously. 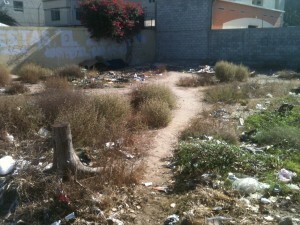 In Tijuana, nothing costs anything. Which is good, because I have no idea what anything costs anyway, and I just have to hope I’m pleasantly surprised when the bill comes. I bought a hamburger in the hotel restaurant for $130, Mexican. Which turned out to be about nine bucks. I bought a bottle of Coke, jumbo bag of chips, liter of water, and a hot dog at a gas station for what was actually about three dollars. I have learned that when I’m hungry, it’s very hard for me to do math. And by the way, buying a hot dog from a Mexican gas station? That was an emergency, and I’ll postulate that it isn’t that much worse than buying one from an American gas station. It’s a total culture shock for me. It’s very humbling to be somewhere where your language isn’t the one in use, and to realize just how ethnocentric you really are. Hey, these people don’t speak ANY English, but they seem to have cobbled together a society and everything. Wow! Tijuana in a single picture. On the second day, I realized I didn’t have any idea what time it was, or where I was. That’s terrifying, yet freeing. Nothing is actually in a hurry in Mexico, however, despite what the traffic would make you think. I didn’t have a single appointment with anyone that went off on time, including a meeting with a professional businessman that wound up four hours late. No shame, no explanation, no calling ahead. Things always run late around here. It took twenty minutes to get my check from a waiter once. It’s just laid-back, to the point of madness, then past that point to acceptance. If you need something done in a hurry, you should probably go to another country. — Come back tomorrow for more random observations on a Mexican week. This entry was posted on Wednesday, May 8th, 2013 at 6:07 am	and is filed under Musings, Travels. The entry is tagged under humor, travel. You can follow any responses to this entry through the RSS 2.0 feed. You can skip to the end and leave a response. Pinging is currently not allowed.